What will it take for African Americans to close the achievement gap in science, technology, engineering and math? It’s a complex issue that experts say involves, among other factors, the public education system, poverty and teachers’ unconscious racial bias. So far, the solutions have been elusive. But there’s a consensus that mentorship is a key. 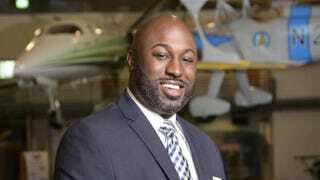 Terrence Southern, 37, knows the challenges that lie ahead for the next generation regarding STEM. He’s a robotics engineer with 15 years in the tech industry who grew up in Detroit, where his dreams were nurtured by an eighth-grade teacher. He wants to be that kind of support for as many young people as possible. He works currently for GE Transportation as a robotics and automation engineer. But the wealth of his experience came at General Motors in his hometown. In his first position at GM at age 23, he led a robotics team tasked with conducting multimillion-dollar projects. A mentor, who’s now a close friend, guided him around the land mines he encountered. Southern recalls that he was almost always “the only black kid in the room” at GM. He says some of his colleagues had trouble with not only his skin color but also his youth. They expected—even hoped—that Southern would fail. Southern has always been determined to succeed. As a kid, he disassembled the family’s VCR to figure out how it worked. He entered college, intent on working in computer science, but clueless about the possibilities. Southern was a sophomore at Tennessee State University when he met his first engineer: Roberts. They connected on several levels, including their shared roots in Detroit. After helping Southern establish his career, Roberts asked his apprentice to pay it forward. In 2003 he asked Southern to meet him after work to tutor students. It took no time for the young engineer to click with the black robotics team from Detroit. He came to know the students personally and continues to be both a friend and role model today. But that fairy-tale ending didn’t come easy. For example, one of the students had a very tough time cutting his ties with the streets of Detroit. Southern had paid for him to attend orientation for the computer science program at his alma mater. Instead, the student chose to continue selling drugs. Southern sat down with the troubled teenager for a straight talk. “I told him some stories about my past, growing up in Detroit, that I never shared with anybody else, because this young man needed to hear it,” Southern emphasizes. That young man quit drug dealing, graduated from college and has his own business today. That situation made Southern realize that high school is too late to start working with kids. In 2006 Southern started a robotics team in Detroit with fourth- through eighth-graders. He mentored them through middle school and high school. Today they’re all college students, and he continues to advise them. He used that approach as a template four years later after relocating to Dallas. By that time, Southern had a bigger vision to reach more black students through a nonprofit organization, which he named Illuminate STEM. Southern explains that the “STEM” in his organization’s name stands for “Sustaining Talent and Elevating Minds.” He and a group of volunteers currently work with about 50 students in after-school programs and at recreation centers in Dallas—with plans, ultimately, to expand nationwide. His teams are typically the only students of color at competitions, like an island in a sea of future white engineers. Shaking his head, Southern remembers their first competition in suburban Dallas. “It took all of five minutes for them to say, ‘Mr. Southern, we’re going to lose because everybody is white,’” he recalls, still in shock. “That broke my heart, but I knew where that was coming from,” Southern admits. He had a long talk with them the next day to boost their self-esteem. Now, brimming with confidence, his teams are accustomed to bringing home trophies. Nigel Roberts is a New York City-based freelance writer. Follow him on Twitter and Facebook.